Looking for a cool and simple (not to mention not too messy) craft this holiday season? I've got the perfect solution for your creative dilemma.The recycled wreath is a festive way to recycle your holiday wrapping paper debris. Cut a circle out of the middle of the paper plate (I trace around a CD or DVD). For younger kids, cover the paper plate with glue. Older kids can use a glue stick. 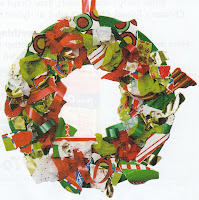 Trim the paper plate with gift wrap, tissue paper and ribbon to create a colorful wreath. To hang the wreath, use a hole punch to make a hole in the wreath. Loop ribbon through the hole and tie it. Hang the wreath where all your holiday guests are sure to admire it! Note: This craft is perfect for Dad or a babysitter to do with the kiddies while you're out doing your holiday shopping! 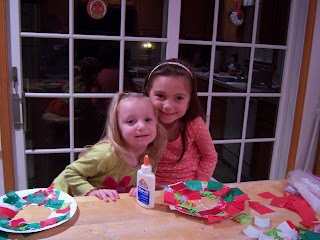 It's obvious from the picture below just how much fun Emma and Harper had making their wreaths! The 100 Most Common Words...Do You Know Them? To Be Green or Not To Be? "It's The Most Wonderful Time of the Year..."